On my ride Saturday, I could smell smoke from a long way off, which seemed a little ominous in the middle of summer when open burning is not allowed. Then I got closer and realized the fire, in a pile of grass straw, had been put out but was smoldering still. This was on Bryant Drive outside of Albany. It’s part of my route most days, but I had skipped that road a couple of days. On the fire department’s Facebook page, I learned that the department had been called to this straw fire on Thursday morning and promptly put it out. In its posting, the department said the fire-blackened pile would be smoldering “most of the day” and was being monitored. Two days later, on Saturday afternoon, it was no longer being watched, except briefly by me, but was still putting out a fair amount of wispy smoke. As the grass seed industry was starting to transition away from open field burning, there was a period when we could burn the residue straw in stacks on the fields that we were were not allowed to open burn. To that end, some of us purchased forage “stackers” that were towed behind medium sized tractors. They used a flail to cut and blow the straw into a loaf-shaped basket the roof of which would periodically be lowered with hydraulics to compress the straw into a compacted loaf of 3 or 4 tons and expelled out the back with a moving chain floor. We would line up or bunch the product of the subject field and, when conditions were favorable, set them on fire. The initial smoke from the outside of the stacks burning was moderately heavy but that soon turned to wisps. At night the stacks would glow but eventually there was little evidence of the fire as they coked the straw and the stack settled onto the ground. You would almost have to walk up to them to feel the heat. A neighbor had tried composting his stacks with limited success and, having see us burn ours, touched his off. After a week or so his stacks had been reduced to low piles of ashes. 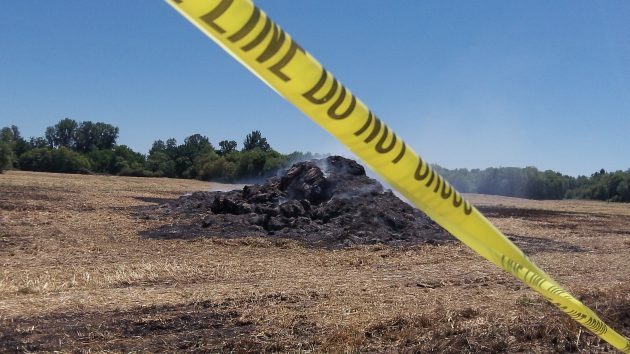 He decided to spread them with a field harrow and burned the hydraulic hoses off his equipment. He hadn’t noticed that we didn’t touch ours for several weeks. The residue in the stacks consisted of ash and a lava like product. I think the clinkers consisted mostly of silicates from the straw and the soil that we also sucked up and burned. We now understand why, when a hay or straw shed catches fire, fire departments protect the surrounding area and let the building burn.